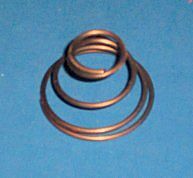 This inside door handle spring is used on all Cars from the 50’s to the 70’s. Used on the 2dr, 4dr, Sport Coupe, Wagon, Conv. and Sedan Delivery. It is used behind both the door handles, vent window cranks and the window cranks. It purpose is to take up the slack between the door panels and the handles.